Four chimneys on a brickworks site that closes next month are being protected and will not now be demolished. The high chimneys over brick ovens at Stewartby in Bedfordshire have been granted protection by the government in recognition of their landmark status. 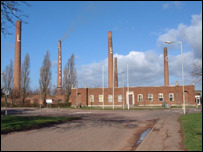 The site was once the largest brick producer in the world but must close because it cannot achieve today's emission standards. More than 200 people have lost their jobs with the closure. However, Bedfordshire County Council's John Scott said: "The chimneys have been given listed status and it's fantastic news for Bedfordshire's heritage. "I'm very pleased that the Secretary of State and English Heritage agreed with our calls to protect these landmarks structures at Stewartby. "It means that they cannot be demolished without consent."